DESIGN BY STINE FOR CUSTOM GIFTS!!! PAINTED WITH LOVE.. Please let me know if you have any questions and I will do my best to put together what you want!!! Send me your design or ideas and I'll make them come to life! Earn compliments WITH EVERY STEP AND SIP YOU TAKE. **I HAND PAINT AND PUT 150% INTO EVERY PAIR I DELIVER!! My favorite part is hearing what you have to say after you receive them. OVERCOMMUNICATION IS KEY. Let me know size, color, design, favorite sport, design, saying, etc. **I have EXTREMELY QUICK TURNAROUND with less than 10 days for each order and I'm flexible with any ideas you have. MY PRICES ARE ALSO VERY COMPETITIVE. I also use only the best materials and supplies. 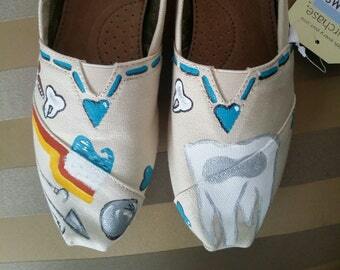 -All shoes will be coated with an acrylic sealant to protect the colors and designs. **I would of course still recommend avoiding puddles or mud. Also, don't leave your shoes out in the sun for too long. -All glass products are cured in an oven and sealed. **Only hand wash please. **I have never had any complaints and my goal is for you to be 150% excited and happy when you see your creation ready to be worn or used. 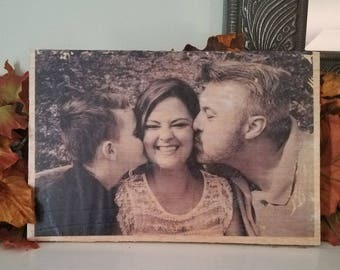 Personalized PICTURE Photo TRANSFER to WOOD !!!! Free Shipping!! Perfect gift! 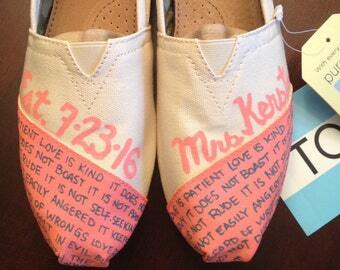 These shoes are truly a work of art. The attention to detail is quite good. Very cute cherry blossoms Toms! I get a lot of compliments on them. Order was amazingly fast. I have ordered painted To s from other sellers that have taken over a month to get. Will return! This is very nice piece of art work; A+++.